I love them. On everything. Don't you? 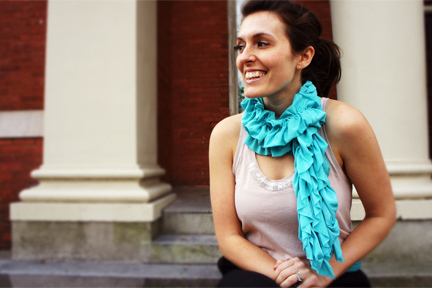 I stumbled across these beautiful ruffled scarves online at The Pleated Poppy and fell in love all over again. So, I did a little digging and found a great tutorial about how to sew my own. I used a tissue t-shirt material, very light and summery. Here's lovely Meggie modeling it for you. After struggling through this one, I'm inspired to work up some more. I've already ordered some more fabric! I plan to alter the pattern a bit, but otherwise, I am super excited about how it turned out. I'd love to make one for you! Please add your comments about the creative projects you are working on (or projects that you'd love to tackle if you had the time!). I'll pick someone at random to receive a scarf! Spread the word!